Ogoh-ogoh are made by the people of Bali once a year. Usually created as a celebration of Nyepi sequence, which is a celebration of the turn of the year based on the Balinese calendar. And in the year 2013, the ogoh-ogoh will be staged in March 2013. Ogoh-ogoh 2013, is expected to be a parade filled with shades of tension. 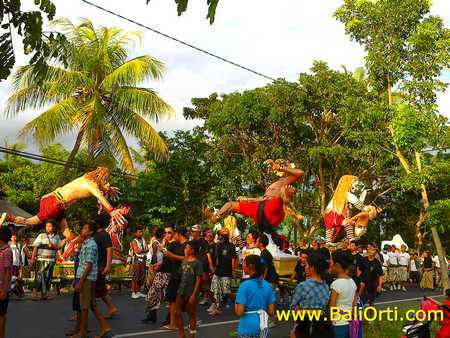 Therefore, the parade of ogoh-ogoh 2013 adjacent to the democratic party in Bali. The party was a democratic election of the governor of Bali, which is filled with political overtones. Bali governor election, will be held in May 2013. From now on political overtones in many areas in Bali has been felt. It will affect the celebration of Nyepi in Bali, especially in performances of ogoh-ogoh parade 2013. Therefore, as in previous years, every celebration of Nyepi adjacent to the gubernatorial days, tensions in the community is very pronounced. So the effect on activity and performance preparation ogoh-ogoh parade. 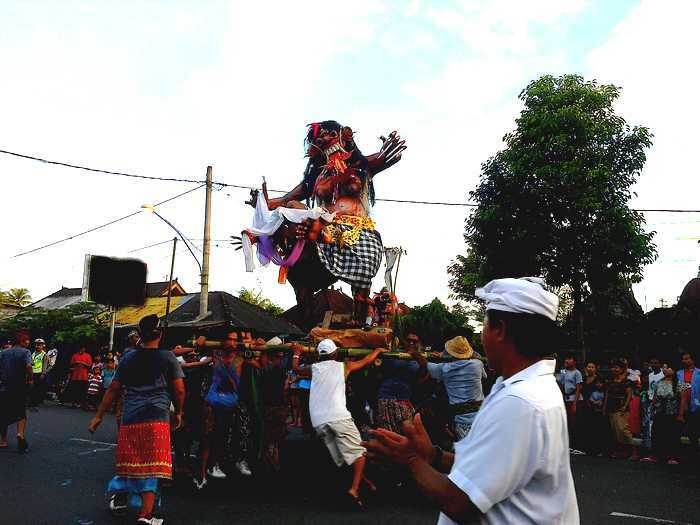 Previously, every celebration of Nyepi close to the election, hold a parade of ogoh-ogoh forbidden. The government reasoned, ogoh-ogoh parade may lead to conflict between earga and groups that make ogoh-ogoh. Because, often in the making of ogoh-ogoh sponsored by political leaders. With the aim of ogoh-ogoh makers promote political figures. Sometimes within each group ogoh-ogoh makers sponsored by different political figures and competing. By not directly, it will be a competition between the groups ogoh-ogoh makers, which can lead to conflict between residents. In the ogoh-ogoh parade which will take place in March 2013, there is no appeal from the government not to hold the parade ogoh-ogoh in society. Meanwhile, making ogoh-ogoh are prepared from now. Preparation of the earliest in the making of ogoh-ogoh is fundraising. If the making of ogoh-ogoh ban enacted by the government, there will be a loss maker among the ogoh-ogoh. Each year, the number of groups ogoh-ogoh makers continue to multiply. Along with the number of population increased. Previously, the ogoh-ogoh makers are divided by country. Due to the great interest in youth to make ogoh-ogoh, the making of ogoh-ogoh divided by the hamlet. But the making of ogoh-ogoh now be done by anyone, by any group. As long as they have enough members, as well as adequate capital. Even the children were currently involved make ogoh-ogoh, and join in the parade ogoh-ogoh is often done by teenagers and adults. Currently parade ogoh-ogoh is the more the merrier. All people participate in the parade. From children to adults and the elderly, all enliven the parade ogoh-ogoh. An estimated 2013 ogoh-ogoh parade will be very crowded and lively. However, concerns arise among the makers of ogoh-ogoh. Because now is the rainy season. Most of the ogoh-ogoh made ​​with paper and sponge. If the ogoh-ogoh are made ​​of wet paper, ogoh-ogoh likely be destroyed during the parade took place. And if the ogoh-ogoh are made ​​of sponge exposed to rain, the ogoh-ogoh parade will be hit as hard. Hopefully there is no appeal from the government banned the manufacture of ogoh-ogoh, as well as current weather lasts ogoh-ogoh parade 2013 bright future and support.